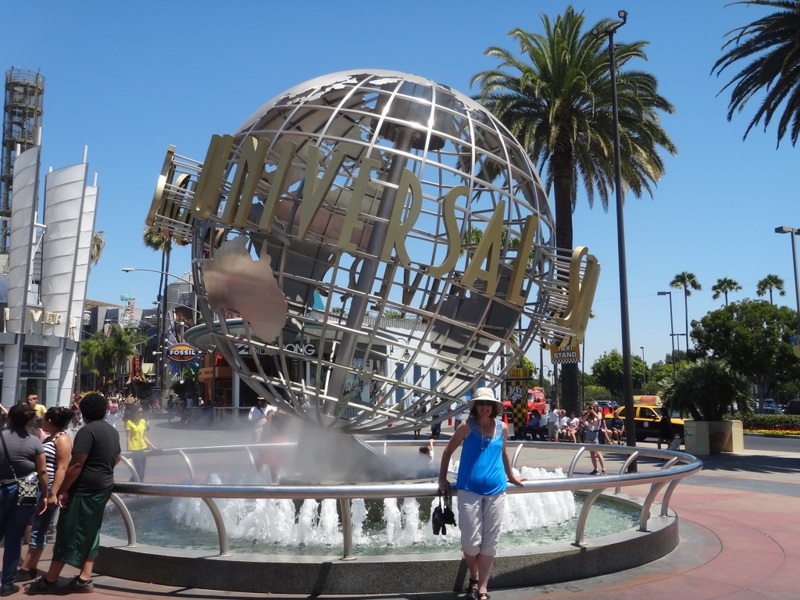 All photographs in today's post are taken at the Los Angeles Universal Studios, California. Photograph 1 - Looking down from the upper to the lower lot where the majority of outside movie scenes and stage buildings are located. 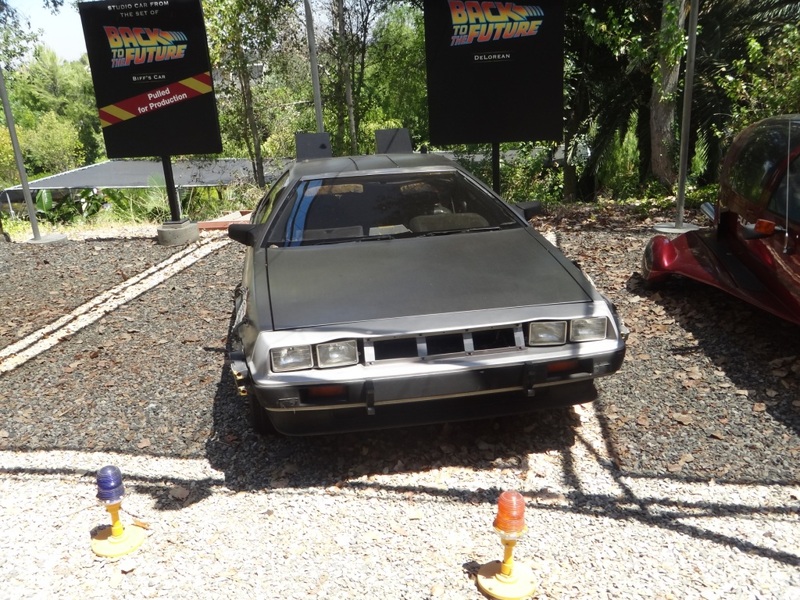 Photograph 2 - The famous "Back to the Future "De Lorean. Just visiting July 2012 for our benefit!!! 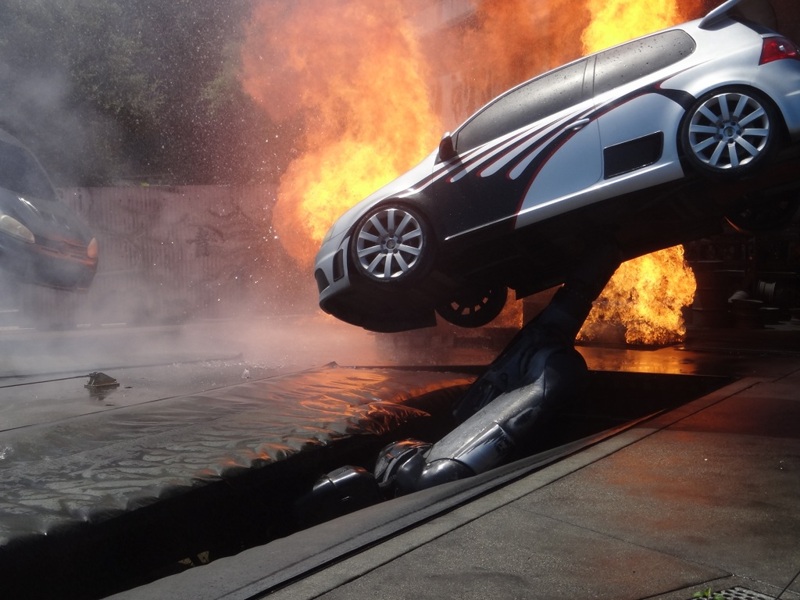 Photograph 3 - Stunt cars used in most spectacular chases including "Fast and the Furious". Photograph 4 - A dry scene in a Costa Rica set. Photograph 5 - Immediately following photograph 4 - a flash flood with rain. Photograph 6 - A set used for many westerns in the past (apparently not used much now). 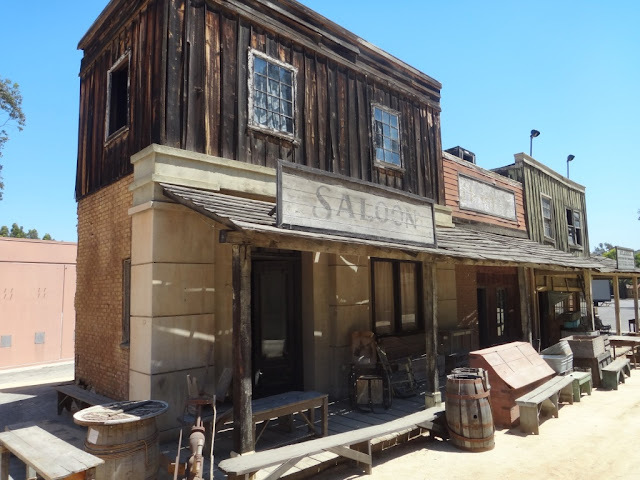 John Wayne and other famous western actors have acted in front of these buildings. As an example in John Wayne and Kirk Douglas "War Wagon". Photograph 7 - Another set used in films that have a story set in the early 20th century. Photograph 8 - For those Wisteria Lane "Desperate Housewife" lovers. One of the houses used in the set. 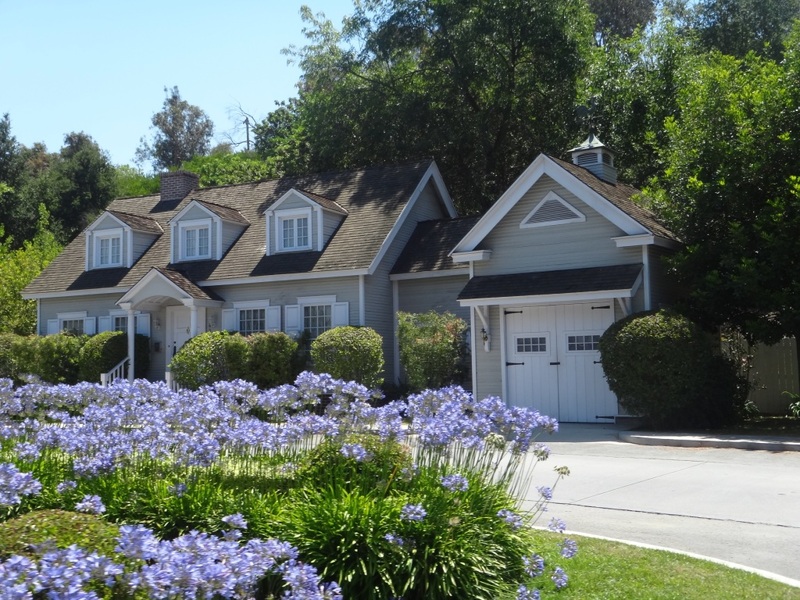 Interestingly, this house was also used in the Leave It To Beaver" TV series in the 50's. Photograph 9 - Another Desperate Housewife house. Note the agapanthas in the front! Photograph 10 - House used in the TV series "The Munsters". Photograph 11 - A B747 crash scene - used in Tom Cruise's "War of the Worlds". 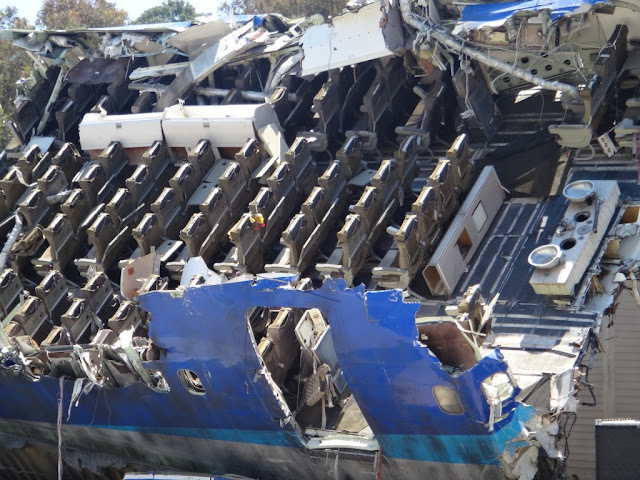 Photograph 12 - And another "jumbo jet" view. 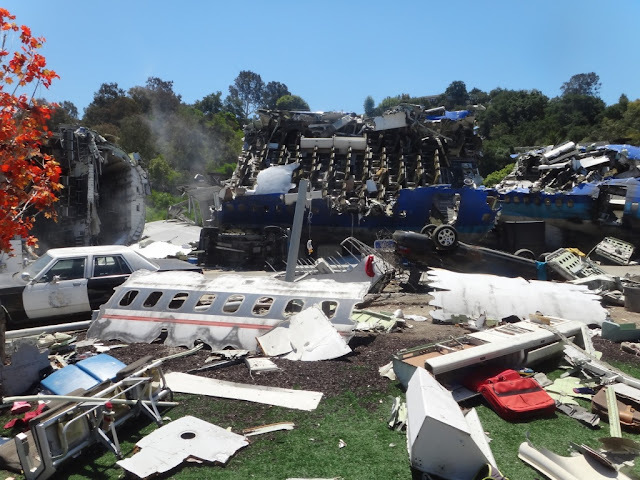 They say that Universal Studios used an actual B747 to make this pile of wreckage. 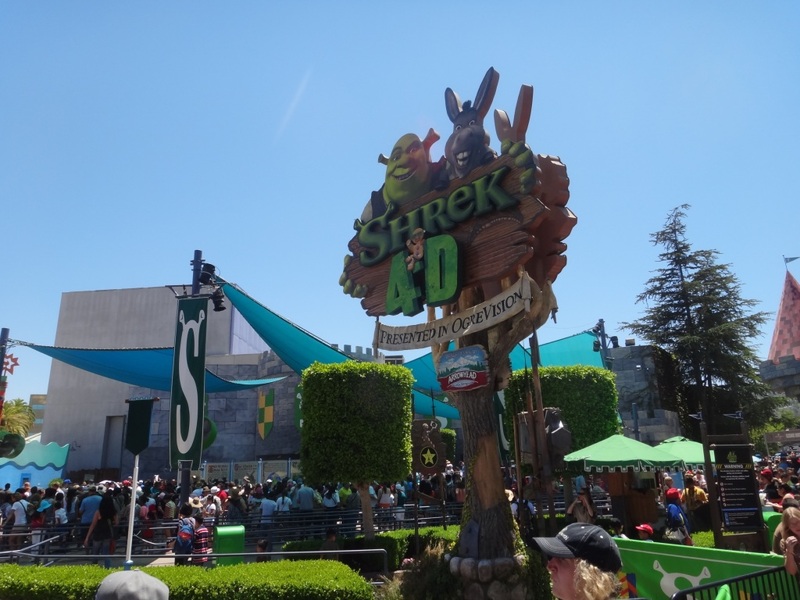 Photograph 13 - The Shrek 4 dimension theme show. The four dimensions includes 3 D glasses and the last dimension allows the viewer to feel certain scenes. Such as water spraying at particular moments and the holograms that actually come right up to you - awesome. Photograph 14 - Norma Jean is still alive! Performing for the crowd. Photogarph 15 - Anne in front of the famous Universal Studio image. Photograph 16 - That's all folks. Finished for the day and onward to Los Angeles's famous traffic snarls. It was great hopping out of bed late this morning. We faced the Los Angeles expressway with a vengeance by taking Connie's top down and thirty minutes after we made it to Universal Studios - ten minutes after it opened. The expressway has a 55MPH speed limit, however, motorists charge along at any speeds well above that. It is quite scary being overtaken on both sides by large trucks and huge pick-up vehicles. It wasn't the speed that is intimidating in fact it is the tyre noise that vehicles make that is scary. The excessive noise is deafening. Also if you are not familiar with junctions and the correct lane you suppose to be on - your a gone'er. Universal Studio is awesome - what more can we say? There are thirteen themes and we only did three! 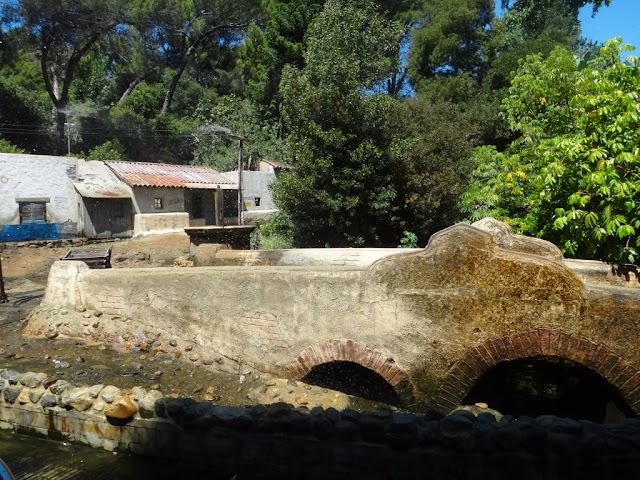 The first was the "must-see" Studio Tour. 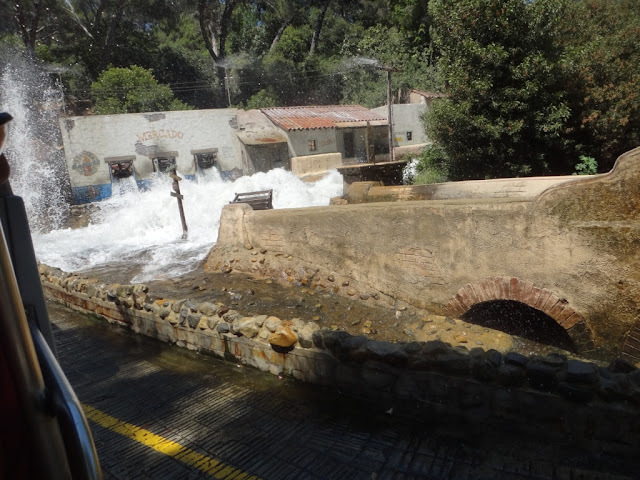 It was a 90 minutes ride into the backlots to see how they made movies with special effects. Plus they put on thrilling shows through movies like King Kong, Earthquake and the famous Wisteria lane where Desperate Housewife are filmed. We passed old movie scenes of 1950'ish westerns, Jaws and The Fast and the Furious. Next we took a ride on the Simpson's roller-coaster. It actually is not a roller-coaster but a car that is a simulator with a 360 deg viewing screen - in cartoon style that is. It makes you think that you are on a real coaster. It was great. Lastly we took the Shrek show. It is a new 4D vision concept. The holograms are great and as an example when the donkey (Eddie Murphy) sneezes the audience actually gets sprayed with water. On the floor below your seat there are jets of air that make you believe something is crawling below you - definitely the sight, sound and feel experience. By the time we finished the three themes the crowds were huge and the waiting time was becoming longer - and we had front-on-the-line passes!. We felt for poor families who had to wait in line for up to 90 minutes to wait. Well, by 2pm we had enough and drove back to our hotel without much ado from the LA traffic. Sadly we'll drive to Las Vegas tomorrow (our third visit to this place) and we have to hand back our Connie. We had her for thirty plus days and sorry to hand her back to Avis. We are leaving LA rather early tomorrow (about 6:30am) to try and escape the traffic. We are certain that Charlotte (our GPS) will trek us through the Downtown expressway. Also it will take about 100 klms to get out of LA's suburbia and head for Las Vegas. We will be passing through the Navajo desert and therefore back to extremely dry conditions. So until tomorrow - cheers. Hi! Just wanted to alert you that photo 8 is actually the Munsters house. It was also used in Leave it to Beaver, as you said. It is right across from the Cleavers' home. Or was. The Cleaver home was moved and is sitting in storage, in poor repair. 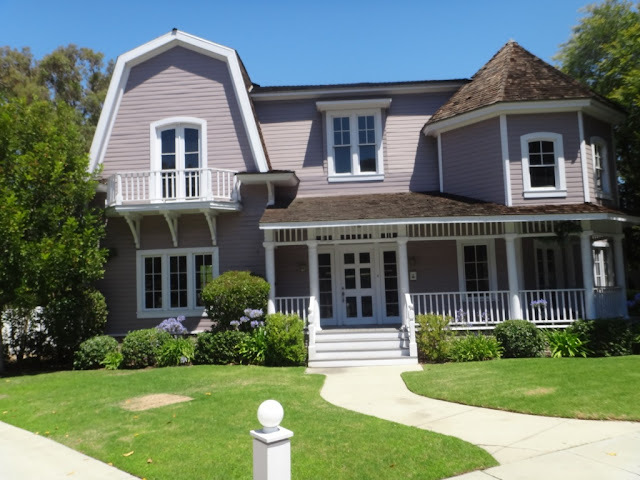 A new replica of Leave it to Beaver house was built for a Leave it to Beaver movie or that 90's TV show, and it is the new replica used for Desperate Housewives. 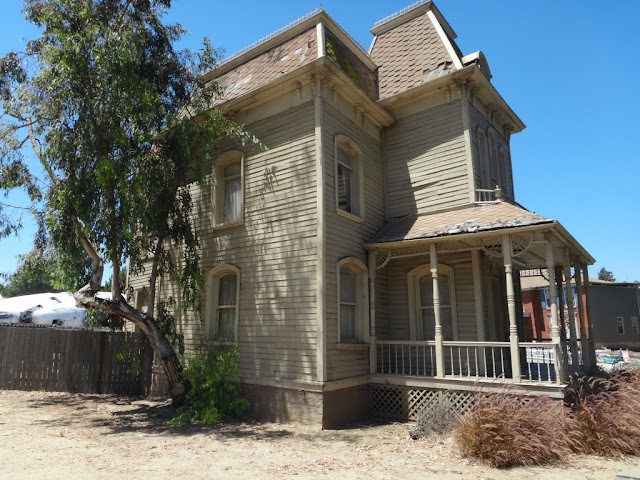 Photo 10 is the house from the film Psycho. Correction to photo 7 and photo 10... 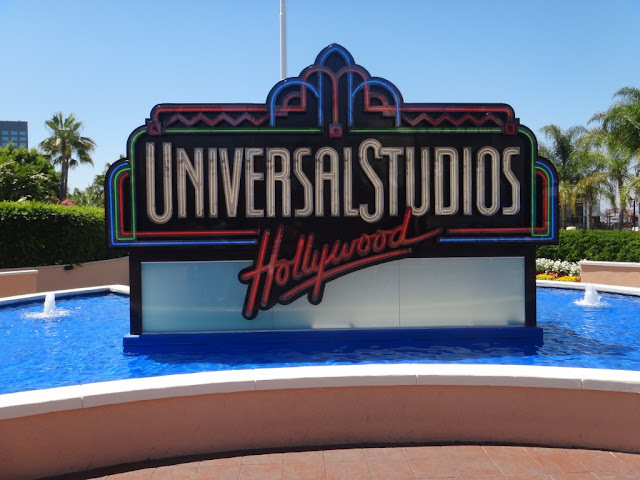 I have been to universal several times over the past 40 years. The house in photo 10 you have listed as the Munsters house is really the house used in the movie Psycho... The house in photo 7 you have listed as being used in the Leave it to Beaver series, is true. 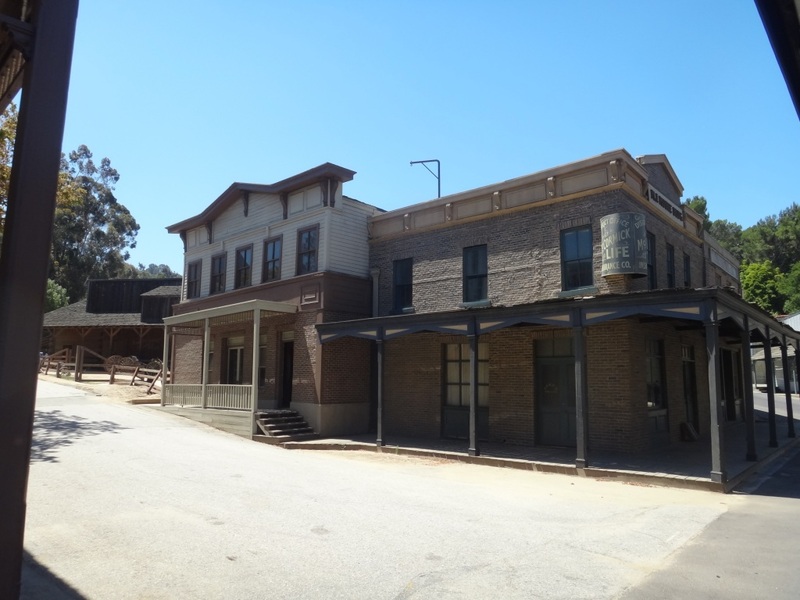 It was used a few times as a haunted house and also in the Andy Griffith show. That house is the Munsters house and has gone through so many changes and colors, and used in so many movies and TV series, I have lost count. 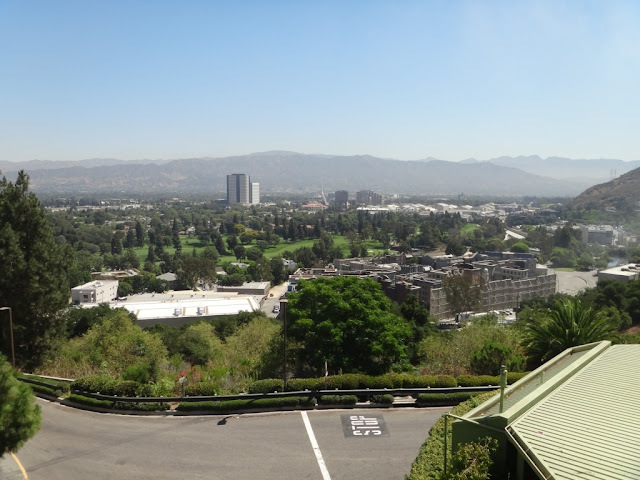 Universal Studios is a fantastic and an interesting place. Enjoyed your photos!! !